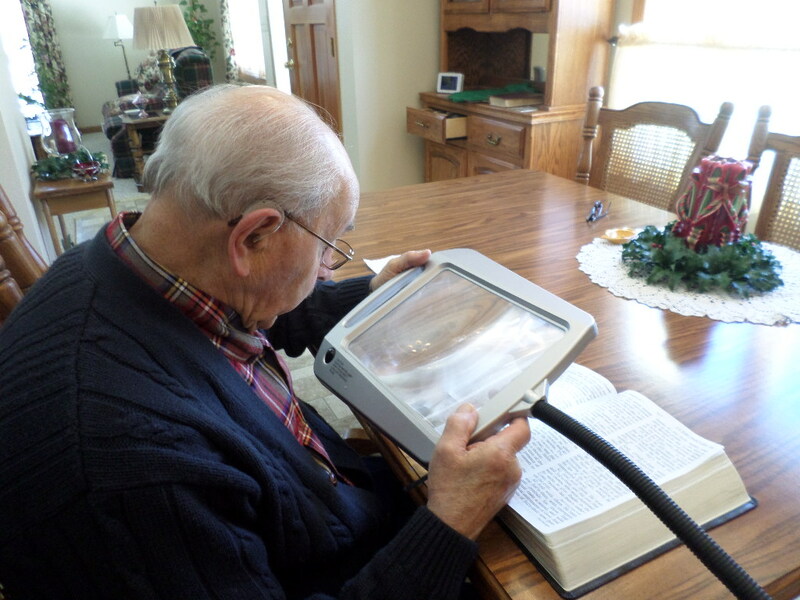 A lighted magnifier provides the two most important features for someone with macular degeneration - light and magnification. With many styles to choose from you will find that there is an illuminated magnifier for every need. As ones macular degeneration progresses the need for more light and magnification becomes necessary for reading and seeing details. A magnifier with light provides one with both. Whether it's a magnifying glass with light used to check a label or a magnifying desk lamp to check the mail, both are useful for everyday living. The lighted magnifiers shown below (from left to right) have 8, 1 and 2 LED lights. You may have to try different magnifiers to determine what style you like best. When you make your purchase, check to see what the company's return policy is so that if you don't like that style you can return it. Fortunately there are lots of choices and styles. Purchasing a lighted magnifier is a smart choice. Often with better lighting, less magnification is needed which means a larger field of vision. 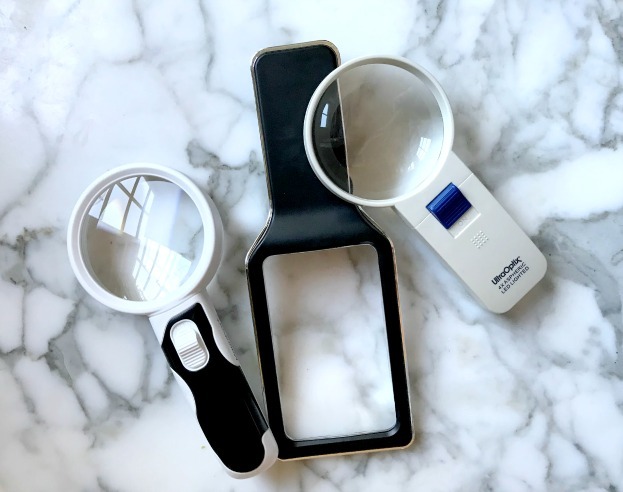 This lighted magnifier set comes with two interchangeable magnifying power lenses - the larger one is 5X magnifying power and the smaller one is 10X magnifying power. The larger the magnifying power the smaller the lens. There are 2 LED lights to brighten up your print or text. Lighting needs change for those with macular degeneration - they need much more light than those with normal vision. 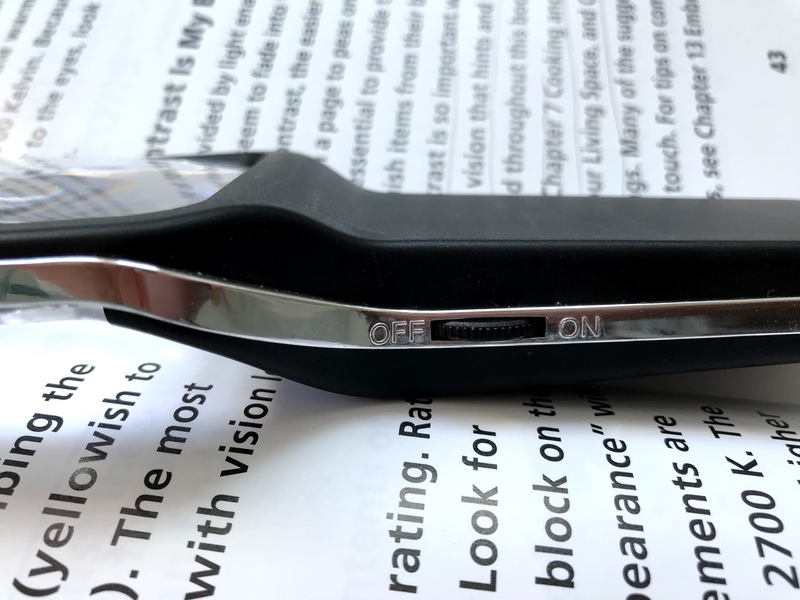 These types of macular degneration magnifiers are used for spot reading - like looking up a phone number, reading a prescription bottle or looking at a recipe card. 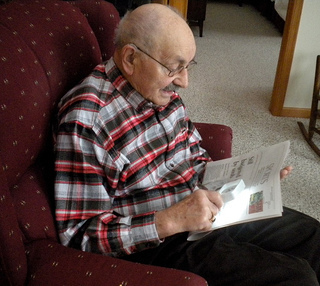 My father-in-law uses his to check the Brewers baseball score in the newspaper. These magnifiers can be quite inexpensive. We bought several of them for my father-in-law so that he can keep one in different parts of the house like the kitchen, the bathroom, the garage and one for the basement. They come in different shapes - round or rectangular and in different sizes. Durable LED lights mean there is no fragile filaments to break from shaking and rattling. They hold up well to jarring and bumping. 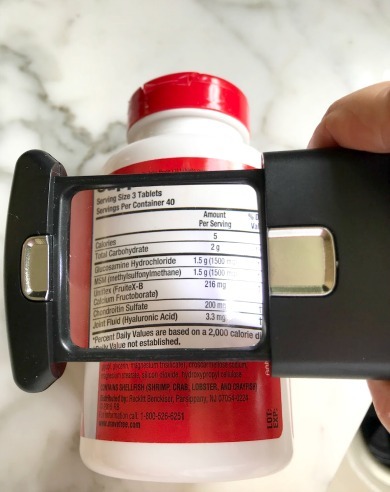 Small enough to keep in your pocket or to carry in your purse, pocket magnifiers come in handy in the kitchen for reading labels, in the garage for reading instructions, and in the bathroom for reading prescription bottles. 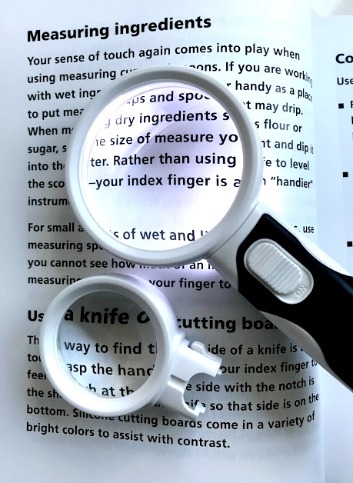 A lighted pocket magnifying glass comes in handy when you are out shopping and want to check a price tag, a label or a menu. The overhead lighting (or lack of) in stores and restaurants makes it especially difficult to see. 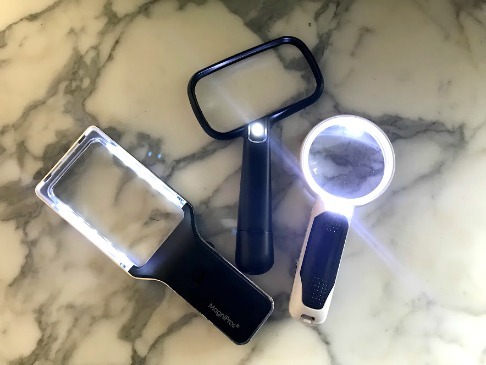 Some people find that just having a small LED penlight is enough, but a pocket LED magnifier will help you see how much that new dress is going to cost and if it needs dry cleaning. 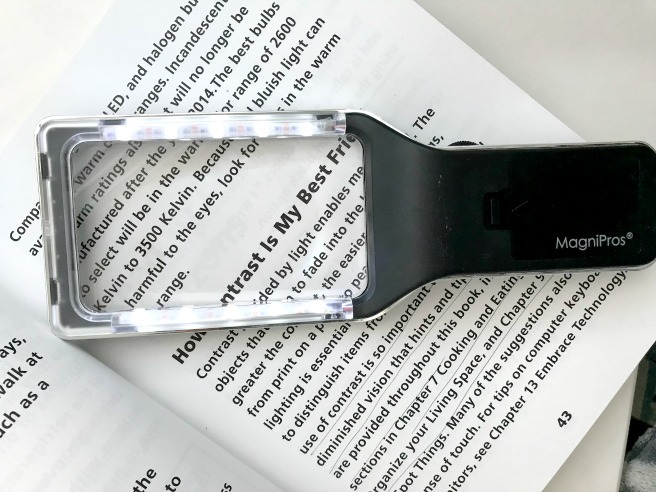 These lighted magnifiers are also handy to use at home for a quick read like looking at a bill, a prescription bottle or the label of a can. This pocket magnifier can be easily carried in your purse or your pocket. It offers 5x magnification and has a scratch resistant lens. LEDs (Light Emitting Diodes) are small, solid light bulbs which are extremely energy-efficient. One of the benefits to this type of lighting is its longevity. They often last for 1,000's of hours. LED magnifiers provide a strong, bright light without glare or shadows making it easier to see or read for those with macular degeneration. MagniPros makes one that has 10 LED lights with 3X magnification. This is a picture of the backside of this hand held magnifier showing you the 5 LED lights on each side. What makes this lighted magnifier unique is that it uses anti-glare SMD LED lights which can last up to 50,000 hours. The size of the lens is large at 4.35" x 2.65" and the optical grade lens ensures a nice clear image. A dimmable switch allows you to adjust the brightness. Another consideration is how easy is it to replace batteries. 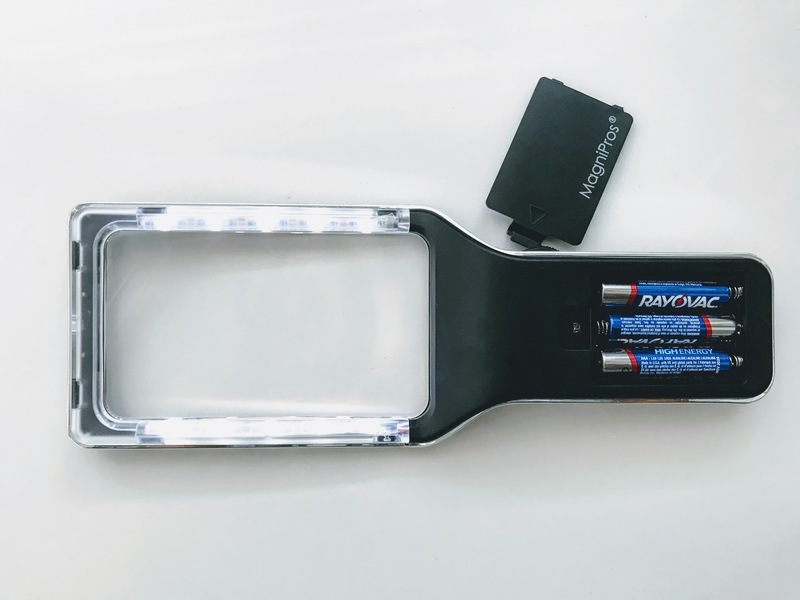 This magnifier takes 3 AAA batteries that has an easy to open and close compartment. The lighting is scattered evenly to reduce glare or too much brightness. A rectangular lens allows for a wide viewing area meaning you can see more magnified print through the lens. Be sure to remove the protective film covers on both sides of the lens or your won't get a clear view. For best clarity and magnification hold the magnifier 2"-4" above your reading material and adjust accordingly. The longer the distance the higher the magnification power will be. Floor lamp magnifiers come in different styles and with different features - the best one being it is hands free. These lamps make reading enjoyable when you can place it next to your favorite reading chair and enjoy a good read without eye strain. While visiting my in-laws I noticed that they had many table lamps but no swing arm desk lamp or swing arm floor lamp. 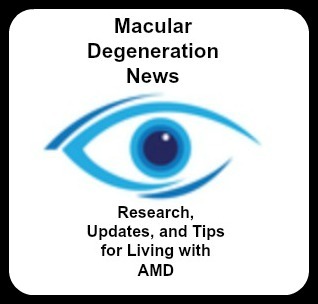 More direct lighting is needed for those with macular degeneration. In fact one of the first signs of macular degeneration is the need for more light. 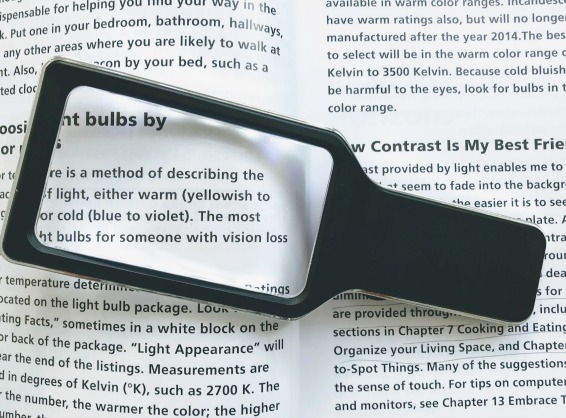 Being able to adjust the lamp or direct the light so that the light hits your book, newspaper or hobby is the most important feature of this vision aid. Floor lamp magnifiers are good for reading or performing hobbies in which you need to be hands free. The larger the magnifying glass the lower the power. Although this one only provides 2x magnifier there is a 5x bifocal insert. This is typical for any page magnifier. However with the combination of brighter lights less magnification is needed. Also many people combine a magnifying floor lamp with large print books. My father-in-law places his Barnes and Noble Nook under the magnifying lamp to read. Bright LED lights provide bulbs that last much longer than traditional light bulbs and do not get hot or give off heat. Cool - these bulbs do not cause heat build-up; LEDs produce 3.4 btu's/hour, compared to 85 for incandescent bulbs. 12 LED lights provide plenty of lighting. You will never need to replace the light bulbs. More efficient - LED light bulbs use only 2-10 watts of electricity (1/3rd to 1/30th of Incandescent or CFL). While you may not be able to view a full page, the large viewing area makes reading easier when more words and sentences can be seen at one time. It's important to have a lamp that can be adjusted and positioned so that the light and magnification is in a spot that provides the best clarity for the reader. A heavy base means that even though the lamp is top heavy it won't tip over. "This is just what my friend needed. She is 90 years old with wet macular degeneration. She tried everything to be able to read--the magnifiers that hang around your neck, those held in your hand, etc. Nothing worked until this. The beauty of it is that she can place it by her chair, against a desk, no worries that it will tip over that way, then she just swings it over and pushes the button on top. She has light and magnification without having to hold anything but what she is reading!" Instead of giving up reading or hobbies you enjoy, adapt by getting the right magnification and light. A magnifying desk lamp is great to have at the desk for hobbies or for going through your mail. Use it to read bills, perform a hobby, or write a letter. Adjust the light so that it is directed onto your reading material or hobby. They come in a variety of lens sizes but the magnification power is usually limited to 2X or 2.5X. The closer the light to the object or material the better the illumination. Choose a swing arm, gooseneck or adjustable desk lamp for better lighting and focus. The Carson Magnifying Desk Lamp has a circular lens that measures 3 1/2" and features a weighted base for stability. You can also get a magnifying desk lamp that uses LED lights. The gooseneck feature allows the lamp to be positioned close to your reading material or hobby. The magnification is 2x with a small section that provides 5x. Often with the brighter LED lights less magnification is needed. 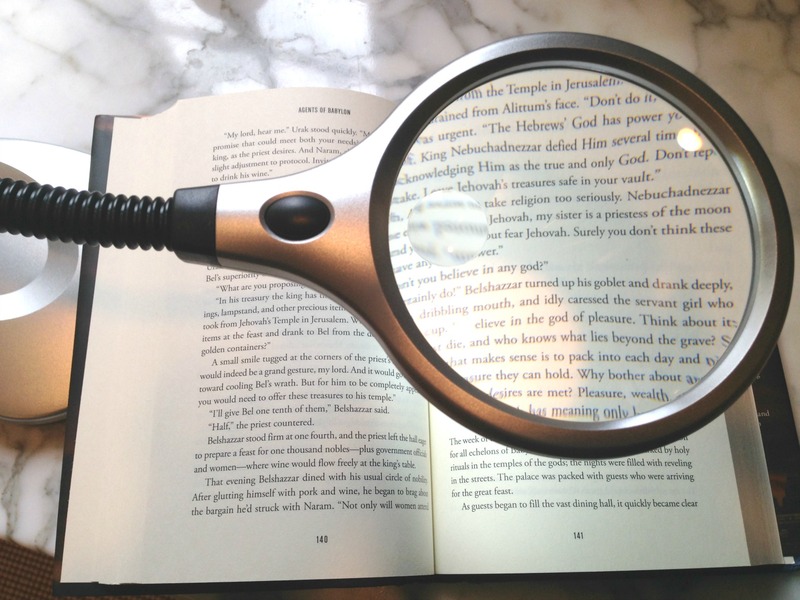 This magnifier light is perfect for any desk or kitchen counter top. It can also run on batteries so you can move it anywhere - even if there is no electrical outlet. Use it to read your mail, write letters, look at photos, or balance your checkbook. Eschenbach magnifiers are high quality magnifiers that offer precision and quality. 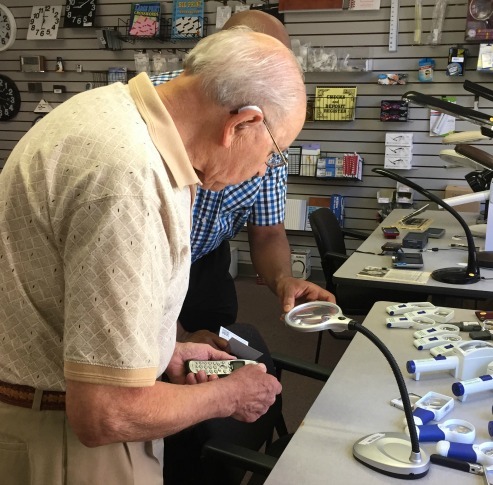 The company has been in the optical business for more than 90 years manufacturing magnifiers for those with vision loss or for those who need magnification for technical purposes. Known also for their constant innovation and product development, Eschenbach is constantly introducing new vision products to benefit those with macular degeneration.